There are places where the surge of global tourism is starting to feel like a tidal wave. Ancient cities around the shores of the Mediterranean and Adriatic are on the front line, their stone streets squeezed full of summer visitors as budget airlines and giant cruise ships unload ever-growing armies of tourists. Take the Croatian city of Dubrovnik: a perfectly preserved historical miniature, carved from honey-coloured stone set in a sea of postcard blue. Around 1,500 people live within the walls of its Old City, custodians of cultural treasures left by everyone from the Romans and the Ostrogoths to the Venetians and the Habsburgs. 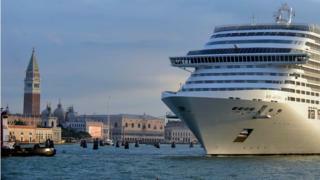 On a busy day three modern cruise ships, each one the size of a floating apartment building, can disgorge five or six times that number of people into the city. They join the throngs of tourists staying in local hotels and in rooms rented over the internet, in streets where almost every elegant stone house has been converted into a B&B. Will Venice be loved to death? The overall effect is Disneylandish - a sense that you meet no-one but other tourists or ice-cream sellers, tour guides, waiters, reception clerks and buskers who are there to keep the tourist wheels turning. Mark Thomas, who edits The Dubrovnik Times, explains the phenomenon like this. "When I first got here, I'd stand back if I saw that people were taking photographs of each other. Now there are so many people that I know if I did that, I'd never get anywhere here." Dubrovnik has a particular problem because its ancient appeal has now been bolstered by that most modern of phenomena - the HBO mini-series. The city, unchanged for centuries, provides the main locations for Game of Thrones. Fans come on pilgrimages to visit the settings. One souvenir shop owner, who told me he doesn't watch the series himself, admitted he had Googled a couple of catchphrases to help attract customers. "It does seem crazy," he admitted, "to stand here when it's 35 degrees, shouting that 'Winter is Coming'." Dubrovnik is not alone in struggling to balance its need for tourists' money with the need to ensure that those tourists don't end up destroying the beauty they've come to see. The tiny Italian island of Capri has warned that it could "explode" under the pressure of the trade that sees as many as 15,000 visitors a day travelling by boat from the mainland, to visit its once-idyllic streets and squares. One local official told The Daily Telegraph: "You can't fit a litre-and-a-half into a litre pot." Florence, Barcelona and some Greek islands like Santorini have suffered too, and it was perhaps Venice which experienced the problem first. Its population has been falling since the 1950s, effectively forced out by the hordes of cruise-ship visitors. Tourism, of course, remains essentially a good thing and in the developed world we nearly all do it. It means trade and cultural exchange and it's both a symbol of rising prosperity and a generator of future wealth. Part of the "problem" is that travellers from traditional sources like the UK, Germany and the USA are increasingly being joined by the new middle classes of countries like Russia, China and India. Add to that the issue of security, which means that many tourists feel safer in Europe than they do in alternative destinations like Tunisia, Turkey or Egypt, and it's hard to see the numbers falling any time soon. It will fall to local governments in places like Dubrovnik and Capri and Venice to find a way of reducing those growing pressures. For now, ideas like installing turnstiles on ancient squares and pedestrian traffic lights on crowded streets may sound rather fanciful. But if that tourist tide keeps rising they might start to seem a little more tempting.